Police implemented a rolling roadblock on the M6 this evening after reports of a man on a bridge near to the Tickled Trout at Preston. The drama unfolded just before 10pm this evening. 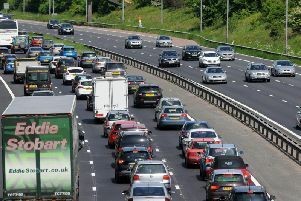 Traffic was taken off the motorway at junction 32 southbound and junction 31 northbound. Just before 11pm, a spokesman for Lancashire Police said: "This evening police responded to reports of a man on a bridge over the M6 at J 31. "The incident caused disruption to the road network but was concluded safely and roads re-opened. "Many thanks for your patience. The man was detained under Section 136 of the Mental Health Act."